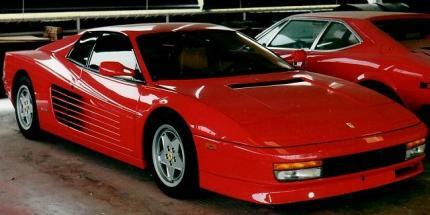 Also the Testarossa is one of the best known Ferraris of all time. @ Max Power: Again, I totally agree with you, the Testarossa is an excellent car, I saw either a black one of these or a 512 TR in Annapolis Maryland once, I was riding with my Grandpa in his 1997 Mazda Protégé when it passed us, it blew my mind, that was the first Ferrari I ever saw in the flesh. I love this car! It's a timeless classic, with very good performance stats, even by today's standards. Long live the "Redhead"! Howcome my Testarosa convertible always tops out at 293 km/h in the classic Sega arcade game "Outrun"? The "Red Head" was the first Ferrari I ever saw and it's still one of my favorites. Just has a real slick and racy yet old school look to it. 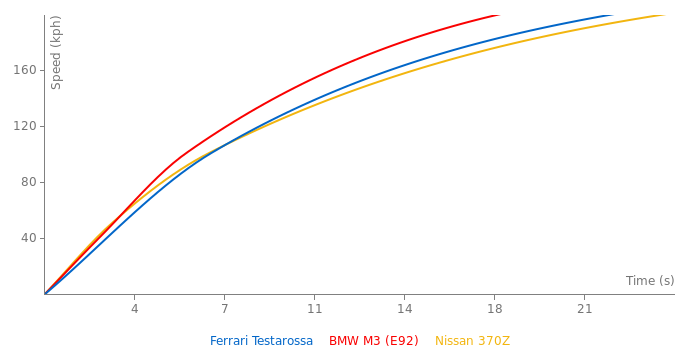 Also, power is 390ps(385hp) and as the times alredy here are slower, I think that 5.3 is 0-60 not 0-62, from where it comes? I seen one go around a corner like it was on rails. 512TR is a whole different car. I think this car is a double post since we already have Ferrari 512 TR.